What's in a name? Quite a lot apparently. For although the Haryana govt claims the rechristening of Mewat was done for administrative purposes, the Opposition alleges a more insidious agenda at work. 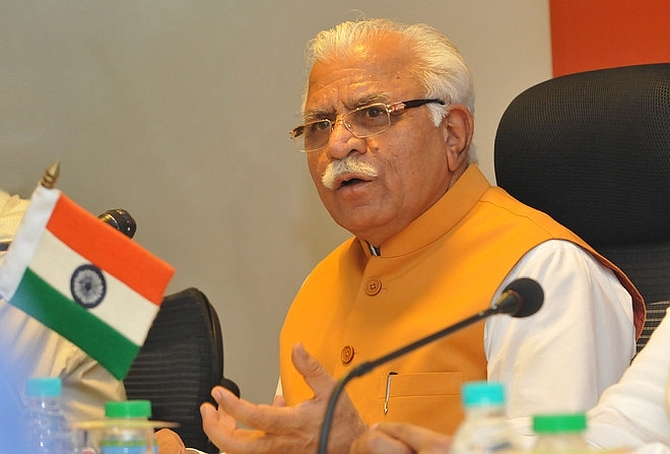 Haryana’s Bharatiya Janata Party government, helmed by Chief Minister Manohar Lal, a one-time Rashtriya Swayamsevak Sangh pracharak, has been ridiculed for renaming Gurgaon as Gurugram. Yet, a more intriguing decision has been to rename the district of Mewat as Nuh. Incidentally, the renaming comes within weeks of the Centre for Policy Studies, an RSS-supported think tank, issuing a ‘study’ about the growing population of Muslims in the Mewat region. The local Congress leadership believes the renaming is the first step in the larger agenda of the Sangh to stoke communal polarisation in an area that has largely remained peaceful since the communal riots during the 1947 partition. “Mewat has water scarcity. It needs education. There is joblessness. The government has offered us a name change,” says Aftab Ahmed, a Mewat-based Congress leader. He says the RSS has issues with the separate identity of the peaceful and proud Meos and is trying to economically and politically subjugate them. On Sunday, the chief minister tried to reach out to the people of Mewat. In a well-attended public rally in Chanddaka village of the district, he stated the official reason for renaming: “People might try to politicise it but the reason behind the change of name is to demarcate areas in the state from those in Rajasthan and Uttar Pradesh. He said the renaming was “part of the government’s development plan (for the region)” and promised new schools and better irrigation for the arid region. The Mewat region stretches from Alwar and Bharatpur in Rajasthan to parts of Haryana and Uttar Pradesh. It derives its name from the Meos, the numerically dominant caste of Muslim peasants. Mewat district, now renamed Nuh, was carved out of areas of Gurgaon and Faridabad by the Bhupinder Hooda-led Congress government in 2005. Nuh, a tehsil, was made the district headquarters. The Meos, the CM reminded those who attended the rally on Sunday, didn’t vote for his BJP in either the Lok Sabha or the Haryana assembly elections of 2014. “You may not have chosen the BJP but you are an integral part of the state and close to my heart. This is the reason behind my fifth tour to the district since assuming charge as the CM,” he said. Ahmed says it is important to appreciate the characteristics of the Meos to understand why the deeper agenda is to scrub their identity. According to research by academician Yoginder Sikand, the peasant caste continues to celebrate many Hindu traditions to this day. The caste traces its origins to upper caste Rajputs but was more likely to have converted to Islam from such castes as the Meenas, Jats and Gujars. Sikand researched the influence of the Tablighi Jamaat, an Islamic revivalist movement, among Meos since the 1920s. It had resulted in the peasants moving towards a more orthodox Islam. However, the youth were increasingly rejecting such religious-based teaching, in favour of more modern education. Locals like Ahmed point to the history of the Meos of fighting the rulers of the Delhi Sultanate and later the Mughals. According to historians, the peasants rebelled against their exploitative Hindu rulers of Bharatpur and Alwar in the 1930s and were crushed. They also bore the brunt of communal riots during partition. The study by the CPS concedes the Meo Muslims were hit by the partition riots but slams social scientists for ignoring how the community had risen to dominate the region “numerically, economically and politically”. Basing its study on 2011 Census data, it says the Meo population is increasing at a faster rate than Hindus in the region. It even hints at economic rivalry for the “rapid” growth of “Muslims in the towns of Mewat district” being a consequence of Meo Muslims “opening small shops in these towns to counter the monopoly of Hindus in small trade of the region”. A social activist working among the Meos, who didn’t want to be named, said the rate of population growth among Meos had actually shown a declining trend. The renaming, he said, was an attempt to scrub the history of a proud people and eventually weaken their economic and political clout. Is the Modi government scared of faceless mobs?